Introducing a listing of St. Elsewhere's formal honors, plus a few bits of awards trivia. Made another new page, a list of awards that were bestowed upon St. Elsewhere during its six-year run. I've started with the 13 Emmy awards that the show won, and I intend to add nominations and other awards as well. The show received at least one Emmy award in each of its six seasons. In 1986, William Daniels and Bonnie Bartlett became the second real-life married couple to both win Emmys for playing a married couple. During that season, the fourth, the Craigs dealt with the death of their son Steven in a car accident, and cared for his newborn daughter while Steven's wife was in a coma. Also in 1986, the show's most heavily decorated season, four Emmy awards, for writing, costume design, sound mixing and art direction, went to the two-part episode "Time Heals", which contains flashbacks from the hospital's history as St. Eligius celebrates its 50th anniversary. The episode does an excellent job of making each time period look convincing and distinct. Alfre Woodard, nominated in 1986 for Outstanding Lead Actress in a Drama Series for playing Dr. Roxanne Turner, has won four Emmys: Outstanding Supporting Actress in a Drama Series in 1984 for a three-episode guest role on Hill Street Blues; Outstanding Guest Actress in a Drama Series in 1987 for a guest role on the pilot episode of L.A. Law; Outstanding Lead Actress in a Mini-series or Special for Miss Evers' Boys, and another honor for Outstanding Guest Actress in a Drama Series in 2003 for a two-episode stint on The Practice. She was also nominated for an Oscar for Best Supporting Actress in 1984 for Cross Creek. 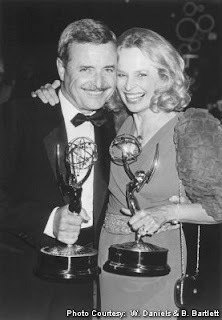 On the DVD commentary track for "Cora and Arnie", for which guest stars James Coco and Doris Roberts won Outstanding Supporting Actor and Actress in a Drama Series in 1983, Roberts suggests that their wins contributed to reinstating the categories of Outstanding Guest Actor and Actress. In the interim, guest performers were usually nominated for Outstanding Supporting Actor/Actress. According to Wikipedia, the award was issued from 1975 through 1978, and not reinstated until 1987. However, St. Elsewhere's awards page at IMDB lists Edward Herrmann as a nominee for Outstanding Guest Actor in a Drama Series in 1986. The Emmy Awards website only goes back as far as 1989. Not sure what really happened there, but I don't feel like researching it any further. In 1984, the year after Coco and Roberts won Supporting Actor/Actress Emmys for their guest appearances, Alfre Woodard took home the Supporting Actress trophy for her guest role on Hill Street Blues as Doris Robson, whose child was mistakenly killed by a Hill Street officer. I could see how those wins could convince them to bring back the Guest Performer categories. That year, Woodard beat out Piper Laurie, also nominated for Outstanding Supporting Actress in a Drama Series for playing stroke victim Fran Singleton for a three-episode guest role at the beginning of St. Elsewhere's second season. In 1988, Woodard was nominated again for playing Dr. Roxanne Turner, but this time for Outstanding Guest Actress in a Drama Series.